Throughout the Province’s history, large-scale floods have been known to devastate communities across Alberta. The floods that began in June of 2013, for example, affected more than 100,000 Albertans in 30 communities. While environmental factors have a major role to play in the occurrence and severity of floods, preemptive measures can be taken to guarantee immediate notification for emergency responders, drainage and utilities companies, public works personnel and the traveling public. During high rainfall periods it is not uncommon for underpasses in large urban settings to flood. Unusually heavy rainstorms are one of the most common causes of underpass flooding, and with the widespread effects of climate change, this is only expected to get worse. Underpass flooding is a significant risk for drivers, and can often result in personal property and infrastructure damage, or in rare cases, serious injury or fatality. Severe storm conditions often compel motorists to take shelter in underpasses. If there is hail present, for example, the cover of an underpass could reduce hail damage to a vehicle. However, there are inherent risks associated with seeking refuge in an underpass during a storm, as this is an area where water collects and rises quickly – causing any nearby vehicles to become partially submerged. This can often result in vehicle damage, and the driver and passengers of the vehicle become stranded. Whitemud Drive, a major east-west freeway in Edmonton, Alberta, stretches from 231 Street on the western edge of the city to Anthony Henday Drive (Edmonton’s ring road) on the eastern edge of the city. Since the year 2000, underpass locations on Whitemud Drive have become severely flooded during storms on at least three documented occasions. Drainage specialists estimate there is a 20-percent chance of flooding per year, as the pipe system below the Whitemud is only built to sustain a one-in-five-year storm. There are five underpasses along Whitemud Drive that have been identified as high-risk locations, including the 106th Street overpass – where a total of 10 drivers were rescued with lifeboats during a storm in July of 2016. 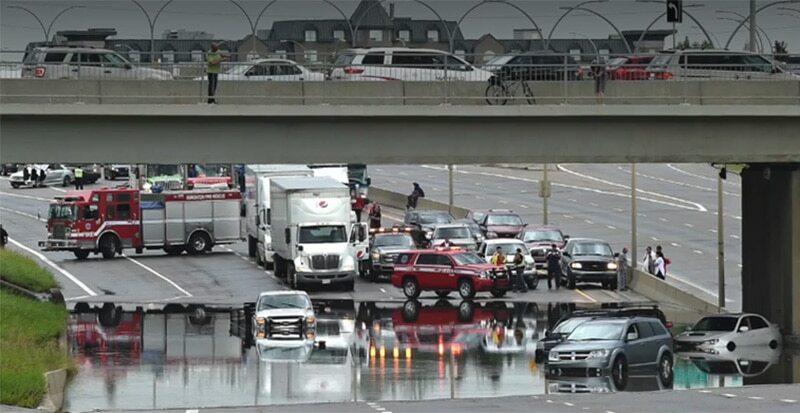 The summer of 2016 proved to be particularly challenging for Whitemud travelers, drainage staff and emergency responders alike, as two underpass locations flooded twice in one month. Motorists who became stranded in underpass waters waited over an hour before emergency crews could respond with a rescue, and vehicles continued to attempt to clear the water with no success – resulting in more stranded civilians. Drivers’ reaction to these conditions proved a pressing need for further education, and a permanent system that could both warn drivers to take alternate routes and notify relevant personnel of the presence of flood conditions. City of Edmonton staff compiled a city-wide flood mitigation strategy in 2017, which suggested a total budget spend of $2.6 billion dollars for drainage work to protect Edmonton communities from flooding damage in major storms. Several months later, EPCOR took over the city’s drainage department, and developed a set of recommendations and a subsequent implementation plan for the following year. That’s where ATS Traffic came in. Photo courtesy of EPCOR via the Flooding & Flood Prevention page. We met with the EPCOR Drainage team to put together a custom flood detection solution to be installed under the 106th and 111th Street overpass locations. These two particular areas have been known to experience flooding during heavy storms, and were selected due to their high-risk nature. Our proposed flood detection solution became a part of EPCOR’s immediate implementation plan for an efficient and cost-effective solution to reduce the risks associated with underpass flooding. By implementing systems for early detection and automated response, municipalities of any size can prevent extensive flood damage and injury. Detection and alerts can warn drivers who may be at risk of becoming stranded, while allowing emergency response staff ample time to deploy appropriate countermeasures. 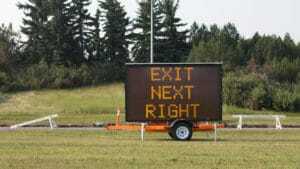 The ultimate goal in these scenarios is always to prevent fatalities or serious injuries due to underpass flooding. The ATS Traffic flood detection system utilizes a combination of capacitance, ultrasonic sensors and video systems to supply real time information about potential rising water levels. Sensors are then integrated using a central communication software system which sends signals to variable message boards to display rising water level warnings to drivers and relay messages to the appropriate control centers and personnel. Two capacitance sensors and one ultrasonic sensor are installed underneath the 106th Street overpass on Whitemud Drive. The system is designed so that if any 2 of the 3 sensors detects flood conditions, alerts will automatically be triggered through JamLogic to activate the digital message boards and notify personnel. Cameras installed on a nearby pumphouses allow personnel to log in to JamLogic to get a visual of the underpass and assess the situation further. This extra measure acts as a failsafe for false alarm scenarios, and allows personnel to take the right course of action based on real time information and current conditions. The ATS Traffic flood detection system is flexible enough to be utilized with existing sensors or detection systems, making integration easier. For example, EPCOR currently has an underground sensor installed by the 111th Street overpass on the Whitemud, with which we paired additional sensors and integrated with the central communication software – JamLogic. 1. Sensors are triggered by flood conditions (a minimum of 2/3 sensors must be activated in order to trigger alerts). 2. A combination of text and email alerts are sent to a predetermined distribution list and message boards are activated. 3. 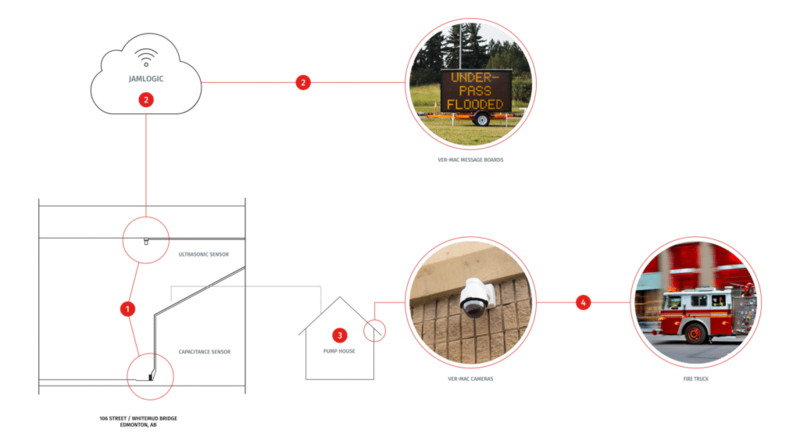 Drainage personnel can log in to JamLogic and access on site cameras to verify flood conditions/eliminate false alarms. 4. In the case of an actual flood, appropriate countermeasures are deployed (i.e. emergency services). The testing phase was successful, and all system components are functioning effectively. While we don’t hope for flood conditions, Whitemud travellers and drainage personnel can rest a little easier knowing advanced warning systems are in place to facilitate quicker response times and ensure driver safety!